Whimsical and elegant at the same time, these earrings with matching bracelet incorporate beautiful butterfly connectors and rich amethyst and garnet gemstone components. 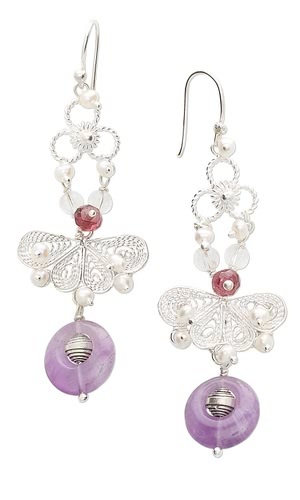 Quartz and button pearls chime in with yet more notes of subtle color. Complete instructions to guide you to a gorgeous finish! String a pearl onto a headpin. Put the headpin through the top loop of a clover connector, working from the front to the back. Wrap the wire up over the loop then back through, then pull the headpin so the pearl is tight against the loop. Wrap the wire up over the loop again, then wrap the wire above the pearl, like a wrapped loop, to secure the headpin in place. Repeat adding pearls to the bottom two loops of the connector. 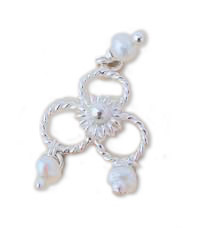 Place pearls on the bottom three loops of the butterfly connector the same way you did on the clover connector. 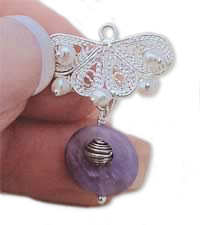 Also place pearls within the top swirls of the butterfly's wings. Nestle a rondelle in the center of a go-go so the holes of the two beads line up. Pass a headpin through the wide side of the go-go, through the rondelle, and on through the thin side of the go-go. 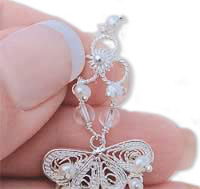 Make a wrapped loop that captures the bottom loop of the butterfly connector you decorated with pearls in Step 3. When you make your loop, be sure the pearl remains at the front of the connector. 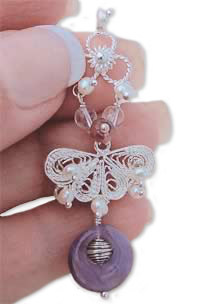 Cut a 1-1/2" length of wire and make a wrapped loop on one end that captures the top left-hand loop of the butterfly connector; string a quartz bead. Snug the quartz bead against the wrapped loop and make another wrapped loop with the other end of the wire that captures the bottom left-hand loop of the clover connector. Repeat for the right-hand side of the connector. String a garnet on a headpin and place it (as you did the pearls) in the top loop of the butterfly connector. Add an earwire to the top loop of the clover connector. When you add the earwire, be sure the pearl remains at the front of the connector.